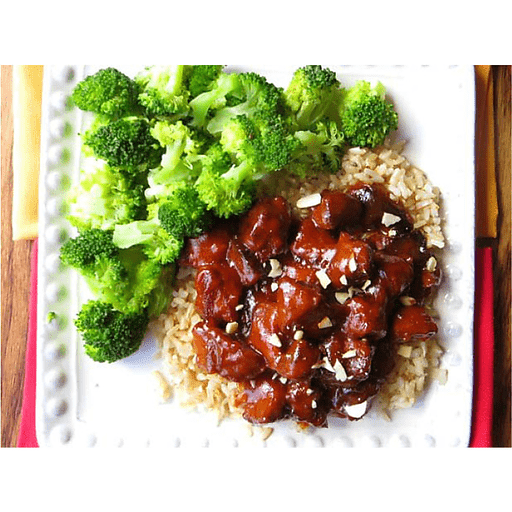 Forget about Chinese takeout and make Slow Cooker Orange Chicken at home instead! 1. In a bowl, mix the orange juice, brown sugar, balsamic vinegar, salt and ketchup. Set aside. 1. Pour the flour in a small bowl. Cover the chicken breast chunks in flour and shake off the excess. 1. Pour a small amount of olive oil in a skillet and brown the flour-covered chicken. The chicken doesn't need to be fully cooked since it's going in the slow cooker. 1. Pour the browned chicken chunks into the slow cooker and cover with the sauce mixture. Give the pot a stir and cook on low for 5-6 hours or on high for 2-3 hours. Serve with a side of steamed broccoli and brown rice. Calories 370, Total Fat 5g (Saturated 1.5g, Trans 0g), Cholesterol 95mg, Sodium 790mg, Total Carbohydrate 42g (Dietary Fiber 1g, Sugars 33g), Protein 37g, Vitamin A 6%, Vitamin C 120%, Calcium 4%, Iron 10% *Nutritional values are an approximation. Actual nutritional values may vary due to preparation techniques, variations related to suppliers, regional and seasonal differences, or rounding.